Did a construction crew unearth one of Halifax's secret tunnels? When a Halifax construction crew dug up what appeared to be a tunnel entrance, a number of people were quick to speculate on the tunnel mystery. But an onsite archeologist quickly quashed any hopes of a secret underground network. “It would be so fantastic to discover this secret that’s lain beneath our feet the whole time and leads to somewhere cool,” Laura de Boer, an onside project archaeologist told CTV News Channel in an interview on Thursday. But the discovery was something a whole lot less mysterious. 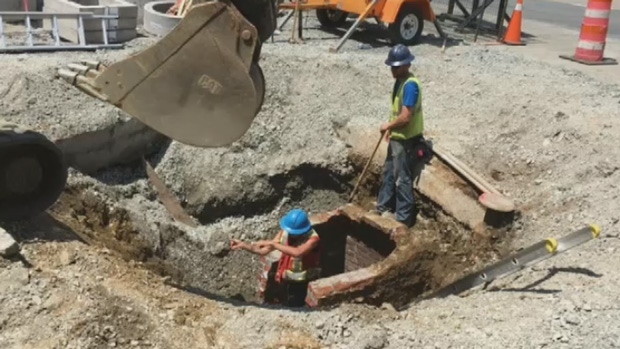 “This is a manhole, basically, a workspace for crews to access a 24-inch clay sewer line that runs under Argyle Street,” she told CTV Atlantic. De Boer told CTV News that it was part of the scheduled renewal of the street and the manhole has since been replaced and reburied. The photos posted online showed a layer of bricks appearing from under the construction site and renewed speculation over whether or not the fabled tunnels that were allegedly constructed during the city’s early days existed. It’s long been believed that a network of tunnels was built underneath Halifax from Citadel Hill to the harbour, although this is mostly folklore. And while there are many tunnels in the basements of historical buildings, a tunnel hasn’t been discovered in downtown Halifax in more than 30 years. There are also stories that gold is hidden in the walls, according to Eric Spinney, who works at a bike shop where an underground tunnel is located. “Whether those stories are true or not, […] it is hilarious the amount of people who do know that something like this down here,” Spinney said. De Boer added that there have been interesting objects discovered at the construction site – including items dating back to Confederation – in a stone sewer chiseled right out of the bedrock. Social media is abuzz after construction crews unearthed some Halifax history this week.